How are Apps and Technology Used in Speech-Language Pathology? Technology is a wonderful thing and we are seeing it used more and more in speech-language pathology practices. 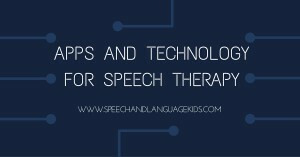 Speech-Language Pathologists (SLPs) are using computers, tablets, smart phones, smart boards, and more in speech therapy for a variety of purposes. Parents are able to download apps and computer games to help their children practice their speech and language skills at home. Some speech-language therapy services are even being conducted over the internet through video conferencing platforms like “Skype”. Children also have easier access to alternative and augmentative communication devices through use of apps that are less expensive than their dedicated device counterparts. Although apps and technology are in many ways making it easier to improve speech and language skills, there are also some dangers to be aware of. These words of advice will help you avoid some common pitfalls when using technology with these children. Screen Time and Language Development: How Much is Too Much? Does this sound familiar? “Oh cool, a new app! Let’s see, who could I use this for?” It’s very easy to get excited about a new app, game, or technology and want to try to find a use for it. However, it is very important to think about the child before the technology. When you are planning a session (or planning something to do at home), you should start by thinking “What is the target skill that I want the child to demonstrate”. After you decide on a skill, think about how you will teach or practice it. Then, and only then, you can take a look at the technology you have and see if it would fit into that session. If not, then maybe you should save that app for another time. ALWAYS start with the child’s goals and skills in mind and then choose the activity afterwards. There are no apps, games, or devices out there that will allow you to simply place a child in front of them and have the child fix all of his speech and language problems without assistance. They don’t exist. Don’t try to find them. You can’t just give your child the app and assume he’ll learn the skill. Children need face-to-face interaction in order to learn to communicate. Children need feedback about how they’re doing and technology only has a limited ability to provide such feedback. If you are using an app, game, or technological device with a child to teach or practice speech and language skills, make sure that you are sitting right there with the child. Talk about how the child’s doing. Ask the child to repeat or rephrase what the app/game has shown him so you know he understood. Have the child try the same task without the technology to see if he can do it in other settings as well. You need to be as much of a part of the session as the technology, if not much, much more. Get answers to all of your questions about apps, technology, and more by joining The Speech Therapy Solution, Carrie Clark’s premium membership program. You’ll get access to all of Carrie’s training videos and printable therapy materials, plus a monthly webinar and an exclusive Facebook group! Join today!